Use this thread to post any issues with FfH2. 1. Fixed an issue causing Sons of Asena to explode when they die and Pyre Zombies not to explode. 1. Fixed an issue causing Dain's favorite wonder to be the Pagan Temple. 2. Fixed a CtD when pyre zombies kill a players last unit. 3. Units running in fear with no place to escape to stay in their plot (instead of dying). 4. Fixed a CtD checking invisibility on units without a plot (fix by Snarko). 5. Fixed a WoC (joining an illegal group) in ConquestMove (fix by Snarko). 6. Fixed a WoC (hiddennationailtiy) in ConquestMove (fix by Snarko). 7. Fixed a python exception in doCrusade. 8. Fixed a bug that was causing resists from promotions to be doubled (fix by Sephi). 9. Fixed a WoC when the first player is killed (fix by Snarko). 10. Fixed a WoC caused by AIControlled and Hidden Nationality units grouping with each other (fix by Snarko). 11. Fixed a WoC (or unneeded bounce) when a unit moves between invis and non-invis or vise versa (fix by Snarko). Note: Patch's are cumulative, so you only need the latest one. But older patches are supplied in case players want to run at an older versions for some reason. 1. Fixed a CtD caused by a conversion in a stack with enemy units. 2. Fixed a CtD caused by taunt causing a unit that can't attack to attack. 3. Fixed an issue that caused the AI Balseraphs to build freaks endlessly. 4. Disciples of Acheron start with Loyalty. 5. Sons of the Inferno start with Loyalty. 6. Fixed a CtD when the Bannor cast rally and an enemy unit is on a town. 7. Fixed a CtD that can be caused when a player founds a city in a plot with enemy units (the fun of invisibility). 8. Fixed a WoC from summons (found by Snarko). 9. Fixed an error in the Order vs Veil random event. 10. Fixed an issue with applying the POISONED_BLADE promotion through explore lairs events. 1. Customized the No Tech Trade Threshold (generally made the AI more willing to trade techs). 2. The AI should gold rush more frequently now. 3. Scorpion Clan Goblins now with 100% more scorpions (art from Kohan 2 converted by Deliverator). 4. New Avatar of Wrath model (art from Kohan 2 converted by Deliverator). 5. Fixed an issue with feasting Denev found (no idea what the actual impact would be, but it cant be good). 6. Fixed an error with the discovery chances string. 7. Updated all the leader attributes for Sephi's AI settings. 8. Disciples of Acheron/Sons of the Inferno will no longer be capturable by For the Horde (will fix a python error). 9. Genesis will now correctly remove all hell terrain from the players lands. 10. Rewrote genesis and correctly set some allowable terrain on some features to fix some feature wiping conditions. 11. Fix for stack casts (multiple units opening a chest as one, etc) by Denev. 12. Rust is 20% easier to resist. 13. Ring of Flames damage reduced from 20 to 15%. 1. Fixed the Vampire and Vampire Lord icons. 2. Fixed the Kuriotate Recon line animations. 3. New Druid model by WarKirby. 4. Removed a block that was keeping barbs from summoning. 5. Fixed an issue causing feature growth to be at 1% the normal amount. 6. Removed barbarian strength growth (it slipped by in the wildmana merge). 7. Fixed an issue that caused fireballs (and other bombardables) to always bombard instead of attacking cities. 8. New icons for all the high priests. 1. New Kuriotate Scout model by seZereth. 2. New Kuriotate Hunter model by seZereth. 3. New Kuriotate Ranger model by seZereth. 4. New Kuriotate Assassin model by seZereth. 5. New Kuriotate Beastmaster model by seZereth. 6. Genesis now removes all hell terrain from your lands (though it might convert again, idea from WildMana). 7. Promotions that pass promtions to summons won't pass them to abilities (ex: Hire Goblin, idea from Denev). 8. Improvement discovery chances are now modified by game speed (idea from jdog5000). 9. Feature disappearance is now modified by game speed (idea from jdog5000). 10. Feature growth is now modified by game speed (idea from jdog5000). 11. Hundreds of AI updates from Wildmana (all Sephi's latest AI python and SDK code reviewed and many changes checked in). 12. Checked in Sephi's OOS fixes. 13. Fixed a CtD caused by switching to no religion (fix by Sephi). 14. Fixed a CtD caused by some spell where the caster dies before the spell resolves (ie: taunt, fix by Sephi). 15. New Illian Adept model by Esvath. 16. New Illian Mage model by Esvath. 17. New Illian Archmage model by Esvath. 18. New Malakim Adept model by Esvath (old Malakim Adept moved to Malakim Mage). 19. New Malakim Archmage model by Esvath. 20. Fixed a python issue with the doCrusade function. 21. Added the Disciple of Acheron unit (fire caster that will occasionally spawn from Acheron's city, chance based on difficulty). 22. Added the Son of the Inferno unit (upgraded form of the Disciple of Acheron). 23. Fixed an issue where players could hang around after being killed if they had an equipment still in the game. 24. New Calabim Adept model by Esvath. 25. New Calabim Mage model by Esvath. 26. New Calabim Archmage model by Esvath. 27. Updated Profane model by Esvath. 28. Updated Prior model by Esvath. 29. New Priest of Leaves model by Esvath. 30. New High Priest of Leaves model by Esvath. 31. New Speaker model by Esvath. 32. New Vicar model by Esvath. 33. New Cultist model by Esvath. 34. New Grigori Adept model by Esvath (current adept moved to mage and mage moved to archmage). 35. Updated Runekeeper model by Esvath. 36. New Vampire Lord model by Esvath (current Vampire Lord model moved to Vampire). 1. Privateers check wasnt valid (fixed by Turinturambar). 2. Fixed an issue with prereqCiv on units (fixed by Denev). 3. Updated joingroup ai function by Sephi. 4. All leaders xml settings reviewed compared to WildMana (mostly involving AI changes). 5. Civic AIWeights adjusted according to WildMana. 6. Fixed an issue that would cause the Barbarian World to do nothing when selected (and sometimes activate when it wasn't selected). 7. Fixed the Tower Shield event so it provides the cover promotion instead of combat. 1. Fixed an issue creating Pirate Coves. 2. Fixed a reference to the Mazatl civ in CvGameUtils. 3. Fixed an issue that can AI to not build catapults (thanks Lone Wolf). 4. Fixed an issue with automatic terraforming. 5. Fixed regenerate map so that all the actions happen on the first turn. 6. Fixed an error loading the Into the Desert scenario. 1. Reduced the Harpy event unhappiness from 15 to 5. 2. AI: Better AI by Sephi (from the Wild Mana Mod). 3. AI: AI Improvements by Skyre (as merged by Sephi). 4. AI: Automate casting by Sephi. 5. AI: Better trigger for declaring war from spells by Sephi. 6. Stasis pauses golden ages by Sephi. 7. AI: Autocasting by Sephi. 8. Regenerate map option by Sephi. 9. Challenge modes modified by game speed by Sephi. 10. Tons of text fixes by Loocas. 11. Fixed an issue where the infernals caused an OOS whenever they captured a city. 12. New Beast of Agares art (model by WarKirby, texture by seZereth). 13. AI: AI Taught to declare nationality when appropriate (from Better Economic AI by Turinturambar). 14. AI: New build orders (from Better Economic AI by Turinturambar). 15. Infernals blocked from building health buildings (will help noob players and the AI). 16. Building promotion removal and adding move from unit doturn to city doturn (for performance). 17. New withdrawl function added (used for retreating withdrawl/feared/invisible units) that limits retreat to 1 tile and kills units that can't retreat (no more teleporting). 18. Fixed an issue with the Prisoner Merchant lair result (reported with fix by Doug Piranha). 1. Fixed an issue that created blockades when a unit gained hidden nationality. 1. Fixed an error in patch "e" where bonus affinities were accidently removed. 2. 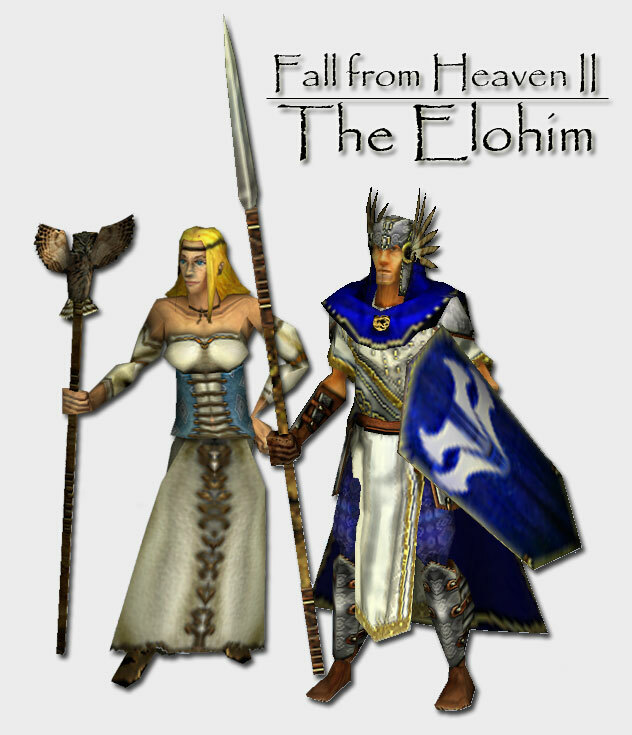 Removed orc sounds form the elohim axeman, archer and longbowman. 3. Fixed an issue that made Freaks unbuildable. 1. New Elohim Scout model by seZereth. 2. New Elohim Hunter model by seZereth. 3. The Clairone (harpy) event now applies hurry anger with the free bard instead of riot turns. 4. Animals can now get courage. 5. New Elohim Adept model by seZereth. 6. New Elohim Mage art by seZereth. 7. New Elohim Axeman art by seZereth. 8. New Elohim Champion art by seZereth. 9. Genesis won't create forests in cities anymore. 10. Barb's get free Ogres instead of free champions (which don't exist for them anymore) after they learn iron working. 11. Into the Desert: Fixed an error when Dirage is razed. 13. Fixed an issue that caused blight to effect player 0 (usually the human player) twice. 14. High Priests of Winter can call blizzards like priests of winter. 15. Marsh's build modifier increased from 25% to 50% (25% more work required to place improvements on it). 16. Fixed the issue that caused damaged stacks to always have the normal number of units. 17. Fixed an error that occured if you started the game next to the Guardian of Pristin Pass. 18. New Elohim Archer unit model by seZereth. 19. New Elohim Horseman unit model by seZereth. 20. New Elohim Chariot unit model by seZereth. 21. New Elohim Longbowman unit model by seZereth. 22. New Balseraph Chariot unit model. 23. New Elohim Horsearcher unit model by seZereth. 24. Tons of text fixes by Nor'easter. 25. Fixed an issue that could make blockades permanent when using revelation on a hidden nationality unit blockading your ports. 26. Ashen Veil and free demonic buildings won't be given to captured Infernal cities unless they are kept (keeps the AC form lowering when the Infernal raze a city that they just pushed the AV to). 27. The Radiant Guard: The Radiant Guard units start with the Bronze Weapons promotions. 28. The Radiant Guard: The Mercurian area starts revealed to the player. 1. Fixed a crash when starting as a civ with a unique race (fix provided by Xienwolf before the issue was reported, now thats skill!). 1. Into the Desert: fixed an error in the defensive pact assignment when dirage is razed. 2. Fixed an error with trait changes (most commonly seen with the Adaptive or Insane trait changes). 3. Fixed culture growth rates that were changed by 3.19. 4. Civics won't show up on the tech chart if you aren't the civ that requires them (so only the Bannor see that Fanaticism enables Crusade). 5. Fixed a crash that could occur during scenario loads. 6. Fixed an issue that can cause unit selection issues (fix by Maniac). 1. Updated Searph model by WarKirby (original version by C.Roland). 2. Converted to BtS patch 3.19. 3. AI will pursue favorite techs (usually religious techs) correctly now, weighting improved and it looks deeper in the tech tree when considering techs). 4. Fixed an issue so Unrestricted Leader game option works. 1. Fixed a graphic error with the Dwarven Smithy. 2. Fixed a graphic error withe Adularia Chamber. 3. Fixed a graphic error with the Amurite Archer. 4. Fixed an issue that could cause a crash when the game starts if the Hyborem menu is selected (thanks to Zifnab!). 5. Fixed an issue with the Decius model (he would show up as a red blob). 1. Fixed a divide by zero CtD in CvCityAI::AI_updateSpecialYieldMultiplier(). 3. New Temple of Leaves model (from Kohan II). 4. New Song of Autumn model (from Kohan II). 5. Pact of the Nilhorn changed from a wonder to a ritual. 6. Fixed the Tablets of Bambur model. 7. Went through and corrected all the building pedia entries. 8. Fixed a problem with the main menu backgrounds so the old ones are back in. 9. New Arthendain model by seZereth. 10. New Khazad Crossbowman model by seZereth. 11. New Angel of Death model by Ploeperpengel. 12. New Khazad Berserker model by seZereth. 13. The Black Tower- Fixed a CtD that can happen when attacking Tebryn's capital. 14. Lord of the Balors- Keelyn will now display her victory message correctly. 15. New Dwarven Paladin model by seZereth. 16. Fixed an issue with Wonder that caused summoner players to keep units for 3 turns instead of 2 turns. 17. Dispel Magic now correctly dispels enemy buffs and allied debuffs. 18. Fixed an issue that could cause unique events to never trigger. 19. Added the ability to examine cities before you decide to keep or raze them (code by Smeagolheart!). 20. Mulcarn Reborn- Updated map. 21. New Pillar of Chains model by Deon. 22. AI: The AI won't priest spam city trapped (UNITAI_MISSIONARY) priests anymore. 23. Units with a duration (ie: non-permanent summons) won't cost unit maintenance or away costs. 24. AI: The AI is more likely to give items in trade for peace if overwhelmed. 25. New Orc Paladin model by seZereth. 26. AI: Leaders can now have a favorite unitcombat (so amelanchier will prefer archers, alexis melee, tasunke mounted, etc) which helps in building units, choosing buildings, and selecting techs. 27. AI: Leaders can now have a favorite tech (instead of the python forced teching). 28. New Svartalfar Beastmaster model by seZereth. 29. New Bannor Chariot, Calabim Chariot, Sidar Chariot, Sheam Horse Archer, Amurite Chariot, Amurite Horse Archer, Doviello Chariot, Doviello Horse Archer, Illian Chariot, Illian Horse Archer, Lanun Chariot and Lanun Horse Archer by the Coyote. 30. 70 Meg smaller than version 0.40 (improved loading times). 1. Fixed an issue where removing invisibility from a treasure chest deleted the chest. 2. Monks can be upgraded to Paladins or Immortals. 3. New Herald model by seZereth. 4. New Repentant Angel model by seZereth. 5. New Chalid model art by seZereth. 6. New Ratha model art by seZereth. 7. New Bannor Champion model art by seZereth. 8. New Donal model by seZereth. 9. New Ophanim model by seZereth. 10. New Luchuirp Archmage model by seZereth. 11. New Clan of Embers Archmage model by seZereth. 12. Fixed an issue with Magnadine hiring units in other cities. 13. New Ljosalfar Mage model by seZereth (old Ljosalfar mage moved to the archmage model). 14. New Ljosalfar Druid model by seZereth. 15. New Sidar Palace model (from Kohan II, compliments of Walter Hawkwood). 16. New Doviello Palace model (from Kohan II, compliments of Walter Hawkwood). 17. New Guild of the Nine model (from Kohan II, compliments of Walter Hawkwood). 18. New Svartalfar Palace model (from Kohan II, compliments of Walter Hawkwood). 19. New Infernal Palace model (from Kohan II, compliments of Walter Hawkwood). 20. New Spider Pen model (from Kohan II, compliments of Walter Hawkwood). 21. Devout can be upgraded to Empyrean priests. 22. Barb units won't pillage lairs in players borders (hellfire, etc). 23. New Svartalfar Marksman model by seZereth. 24. New Corlindale model by seZereth. 25. New Dwarven Smithy model (from Kohan II). 26. New Pallens Engine model (from Kohan II). 27. New Adularia Chamber model (from Kohan II). 28. New Temple of Kilmorph model (from Kohan II). 29. New Tablets of Bambur model (from Kohan II). 30. New Blasting Workshop model (from Kohan II). 31. New Soul Forge model (from Kohan II). 32. New Temple of the Order model (from Kohan II). 33. New Code of Junil model (from Kohan II). 34. New Stigmata on the Unborn model (from Kohan II). 35. New Temple of the Veil model (from Kohan II). 36. New Gibbon Goetia model by seZereth. 37. Return of Winter- Modified to make the AI more aggressive, especially at higher difficulty levels. 38. Hidden Nationality units will now show attack odds correctly (thanks to Xienwolf!). 1. The Iron Orb event no longer occurs to the first player to qualify (its random like most other events). 2. Fixed an animation issue with the Khazad/Luchuirp hunter. 3. Lord of the Balors- Added rivers to the map. 4. Mulcarn Reborn- fixed an issue that would cause Volanna to spawn on the ocean. 5. Fixed an issue with the blood effect on gorilla's. 6. Cities reduce spell damage by a quarter of their city defense to units in them (so pyre zomebies, tsunamis, ring of flames, pillar or flames, etc isnt as effective against units in well fortified cities). 7. Tsunami's average damage reduced from 50% to 30%. 8. Worldbreak and the city fire event cannot destroy Demonic Citizens anymore. 9. Demonic Citizens won't be granted when the infernal gift cities anymore. 10. Mercurians no longer get angels when animals die. 11. Pillaging will remove promotions that are removed by combat (such as invisibility). 1. Fixed the animations for donal, paramanders and tuetorix. 2. Fixed an error with the Steal spell. 3. Updated Against the Grey scenario by Nikis-Knight. 4. Fixed an issue with the Tolerant trait that allowed the player to have 2 palaces. 1. Fixed an error with commerce reads in building loads. 2. Magic Immune give 50% resistance to the magic damage types, instead of 100%. 3. Vitalize wont show as castable on marsh's (since it doesnt do anything to them anyway). 4. Barnaxus will get the abilities from the city he is built in (if they have the pallens engine, etc). 5. Fixed an issue with invisibility from promotions (units that could see invisible couldn't see them). 6. Fixed an issue where defensive withdrawal caused the attacking unit to lose double the normal amount of movement points. 7. The new player popup wont happen in multiplayer games anymore. 8. Fixed an error with the Shrine of Camulos event. 9. OCC no longer has a limited amount of national wonders. 10. Added the Against the Grey scenario. 11. Fixed an error that could cause python errors and CtD's when casting For the Horde. 12. Fixed an error revealing invisible units (now they will be kicked out of stacks invis allowed them to be in) that could cause CtD's. 1. Fixed an issue where barbs granted way to much xp. 1. Civ specific unit art will now be used for upgrade buttons. 2. New Govannon model by seZereth. 3. Mistform is now an elemental. 4. Immortality will not save an angel sacrificed on the Pyre of the Seraphic. 5. Mulcarn Reborn: Auric can't create 2 Drifas. 6. New blood splatter combat effects by seZereth. 8. Fixed an issue that could cause the random good/neutral/evil leaders to spawn as colony leaders. 9. Fixed the Counterfeit event (so that it correctly reqs Runes to pick the 3rd option). 10. Fixed an issue that prevented a city from ever having a negative production modifier (such as a new city under pacifism). 11. Barb units offer less xp than the units of your enemies. 12. Barbarian world units (Orthus, Acheron, etc) will grant xp, even past the 100xp limit. 13. Fixed a WoC error when the AI tried to set a hidden nationality ship to the Assault ai type. 14. Fixed a major AI issue where Ai (or automated) workers were unable to improve a plot if they started the turn in it. 15. Fixed an issue that could cause upgraded units to get bronze and mithril weapons. 16. Fixed an issue where units effected by fear could charge into enemy stacks. 1. Fixed an error in the Holy Child event. 2. Started the great code review (simplification/removal of unnessesary code). 3. Pacifism loses the +1 gold cost per military unit, and gains a -20% military production modifier. 4. Events that target and spawn wont promote both units (ie: the enchanter event wont give enchantment 1 to both the spawned unit and the axeman/swordsman). 5. The Radiant Guard: fixed an issue that can make the scenario unwinnable if you kill Hyborem before Basium arrives. 6. Poisoned will be removed the turn you fully heal, not the turn after. 7. Fixed a CtD when capturing a unit with hiden nationality from a stack with neutral units. 8. New Svartalfar Longbowman unit model by seZereth. 9. You can no longer declare nationality when on a stack with enemy units. 10. Barbs can't found cities on mana nodes or found disabled plots (like the dungeon area in the Cult scenario) anymore. 11. Being immune to magic won't make you immune to abilities. 12. Releasing a unit from a cage is now an ability. 13. Extra duration from the Summoner trait decreased from +2 turns to +1 turn. 14. The Summoner trait now allows all summons to start with Combat 1. 15. Added the Reveal spell (allows a unit effected by Nox Noctis to forfeit its invisibility). 16. Production popup now has the civ race icon graphics instead of generic icons (so the orc warrior icon instead of a normal warrior for the clan). 17. Immortals won't trigger the unitkilled python function (keeps Decius from cloning when an immortal host dies and fixed other problems). 18. The Great Library gives 1 free sage instead of 2. 1. Fixed the Boar Rider (its supposed to be a Horseman UU but it had Horse Archer stats). 2. New Svartalfar Ranger model by seZereth. 3. Added an Intro popup for new players. 4. Fixed a CtD if an invisible unit uses mirror on an enemy stack. 5. Wages of Sin: You will only see the Valin and Rosier intro messages the first time they are created (for black mirror combos and such). 6. Mulcarn Reborn: turns between switches changed from 20 to 40. 7. Mulcarn Reborn: Decius now enters the game on turn 5. 8. Mulcarn Reborn: Increased starting units. 9. AI: lowered the AIs chance to spam ships (weighting lowers if ships > players amount of cities). 10. Heroes and non-UU units only one civ can build (like flagbearers) are correctly listed in the pedia as being unique to a their civilization. 11. Fixed an issue that caused players that entered the game late (Basium, Koun, some scenario characters) to start with a reduced score (they weren't getting power/asset/score points for the techs their team had). 12. Reduced the cost for the Mithril Golem and Meshabber from 5000 to 1200. 1. Fixes a post combat python function with Lightning Elemental. 2. Added the Wages of Sin scenario. 3. Added the Mulcarn Reborn scenario. 4. Fixed range problems with a lot of the units (so they would act as melee in the combat animations). 5. Fixed the Lion upgrade to Lion Pride chance. 6. All great people are now marked as defensive only (so they won't be mutated). 7. Fixed Ars create wraith chance. 8. New Lanun warrior that doesn't look quite as advanced as the old one. 9. Strategy text added for all buildable units (woot! this took forever!). 10. Crazed and Enraged are no longer possible outcomes from mutation. 11. New Infernal Assassin model by seZereth. 12. New Infernal Marksman model by seZereth. 13. New Infernal Crossbowman model by seZereth. 14. New Infernal Phalanx model by seZereth. 15. New Calabim city art by C.Roland. 16. New Calabim Palace by C.Roland. 17. Heralds Call now gives the blessed instead of the burning blood promotion. 18. Unit specific abilities will be displayed in the unit help text. 19. Cleaned up the promotions lost so that only valid promotions are listed (instead of every unit having all the spell spheres listed). 20. Fixed a missing graphic issues with Luchurip/Khazad cities. 21. Fixed a python error in the Taunt ability (getImmobileTimer). 22. Fixed a python error in the Shrine of Camulos event. 23. Immortal units duplicated with the Black Mirror won't be duplicated anymore. 24. Culture flips use conscription rules now (so they won't be able to produce multipe heroes, units that can't be trained, etc). 25. You can't cast For the Horde if you are at war with the Barbs. 26. Increased the rate of the AC slightly (from 50 + 15 per player to 50 + 12 per player max). 27. New Svartalfar Druid model by seZereth. 28. AutoRaze barb units units will only autoraze their own cities (so they cant destroy allied cities they are in). 29. Players with no state religion can inquisition now. 30. New Luchuirp Mage model by seZereth. 31. Bunch of new Malakim unit models. 32. Into the Desert: the Calabim version has had a significant amount of tweaks form Nikis-Knight. 33. AI: Fallow players won't value the food value of improvements (so hyborem won't be building farms). 34. New Svartalfar Assassin model by seZereth. 35. Archery gives +50% chop production. 36. Lumbermills moved form Iron Working to Archery. 37. Workshops moved from Smelting to Construction, given +1 commerce, the +1 hammer moved from Construction to Smelting, given +2 hammer at Guilds. 39. Windmills given +1 hammer. 1. When Basium or Hyborem enter the game is causes an OOS error in multiplayer games. Dropping and rejoining the game will allow the game to continue. 1. "GFC error: failed to initialaize the primary control theme" error loading the mod. You will recieve this error if FfH isn't installed in the correct location (under Program Files\Firaxis Games\Sid Meier's Civilization 4\Beyond the Sword\Mods). If you don't have Civ4 installed to that location just make sure the FfH is installed in the same directory as Final Frontier, Age of Ice and the other mods that came with BtS. Also make sure you have installed the full mod and not just the patch. 2. The mod loads okay, but when you go to start a game it crashes. You experience this error if you aren't running BtS patch 3.17. 3. If you are running BtS 3.17 and the game still crashes when starting your computer could be having problems playing the opening movie. Disabling movies resolves the problem. If this is your problem you will often be able to play scenarios but not the main game (because movies dont play before the scenarios). 4. If FfH crashes when starting a game and when you look in the Civilopedia from the main menu and you can't see units, then you have only applied the patch and you need to download and install the main mod (then reapply the patch). 5. While playing if your units look okay when moving but turn back to normal civ4 units when standing still its because you have "Freeze Animations" turned on in your game options. 6. Vista users have reported crashes if they have UAC (User Account Control) enabled. 7. Some sites you download the mod from lose the .exe extension on the file, so you just get a file that windows cant use. Renaming the file and putting the .exe back on the end fixes the problem. 1. I dont expect anyone to read the whole thread. But please read this post and see if your issue is addressed in patches you don't have applied, in a patch that hasn't been released yet, or is a known issue. 4. Please don't report issues for other mods in this thread, even FfH modmods. Haunted Townhouse event's Infernal Only option doesn't seem to change any Commerce output for the city, nor the city tile. Combat Log is disabled to enhance game performance. It can be restored manually by editing the CallBack defines. Would you mind posting the patches in reverse order, with the most recent on top? Once you have that many patches it gets annoying to have to scroll down that far, and easy to overshoot. Also, any idea when patch r might come out? There seems to be a problem with the new Bug thread too. It says patch q. I thought patch r (with the two new scenarios) was out...maybe not. On a more serious note, we found a bug in a multiplayer game last night. Units seemed to go missing (two early scouts, a few warriors...). Then we started to pay more attention and noticed that the game was not zooming into combat for the player to view. We assumed that the problem was caused by combat taking place on the other players turn and the AI moves not being tracked on the local computer. Not a problem, we could just read the combat log to see the results. Then we discovered that the combat log was not recording anything. None of our combats were shown in the combat log at all. If you would like a save game, I may be able to get Unclethrill to post it later. He hosted the game and the saves are on his computer. No, we're still drooling over it. "There are no friendly civilians!" Incomplete Combat Odds Breakdown: Griffon attacking Lizardman, breakdown of combat factors does not show the Lizardman's +50% vs Animals. Combat odds themselves are calculated and displayed correctly, however. This is a cosmetic issue. Is there a cosmetic issue thread, or did I imagine that? I didn't see one sticky in the forum index. Life Node Flare-up Event Destroys Ancients Forests: All the AFs in a 5x5 square centered on the node are removed by this event. Forests and New Forests are not affected. This seems very out-of-flavor for the event; the event text states that the flare-up causes healing around the node site. I don't think AFs would be considered a type of damage. If the event is intended to remove AFs then it should probably just demote them to forests, or else forests and NFs (and burnt forests) should also be removed. Hopefully this is unintended, however, in which case the removal of AFs should be prevented. Crazed Angry Old Man Event: This event triggered in a city that contained temples for OO, FoL, and RoK. Event options for all three religions were available. I was able to drown the man and receive a Stygian Guard (the OO choice), even though my civ followed FoL. The SG did not abandon me for failing to follow his required religion. I would consider this a feature, actually, but thought I should report it just in case it warranted a fix. "Bugs Reported with Fix Reccomended" should be Recommended. Game often crashes at gamestart. Loading autosave fixes this so not that big of a problem, if you know about it. Rejoining causes OoS every time. Rehosting with save fixes it. And of course, changing to Hyborem or Basium causes OoS, rehosting with save fixes it. #10 of Unconfirmed Reports in Xienwolf's list is interesting to me. I presently have an epic game as the Bannor on turn 429 that is hanging indefinitely upon ending the turn. I suspect, but don't know for sure, that it is the Illian ritual The Deepening that is doing it. I was trying to upload the save to the forum last night, but was getting some errors. I'm going to try again when I get back to my game machine. Until then, I have a question: Does The Deepening trigger an unusually long delay of game normally? EDIT: Added my save game file. I tried changing the pre-reqs for The Deepening to TECH_NEVER and managed to get to the next turn. It still runs slowly but at least it runs. Nevertheless, I'm not entirely convinced that this is a problem with the ritual. My success in getting this unstuck could be due to powering down my computer for the day and trying again (ie. a memory leak of some sort). Regardless, this game I'm playing right now is a useful showcase for how things slow down later on. If I play 10-15 turns, I'll eventually get a FATAL ERROR: Bad Memory Allocation message followed by a CTD. Most annoying. I hope one of the tech guys in the FfH team finds this interesting. UPDATE: The Deepening doesn't make the game hang forever. Just a very long time. I managed to get past that turn. The save is still a good one for seeing the speed of the game later on. Not unplayable though. Running patch q, single player, XP, Prince level, Tasunka, custom game. I completed researching Education, opted to switch to Apprenticeship civic, selected Drama as my next research, went into one turn of anarchy -- and then apparently got stuck in anarchy. The "Anarchy!!!" banner went away, but the replacement research banner was stuck at "Drama (1)", and all my city production queues remained at anarchy speeds (i.e., very slow). Pushed ahead 10 turns, tried switching back to the Tribalism civic, but the problem persisted. Save file is attached. ..fritz..
We continued our LAN game referenced in #4 above and ran into another problem. We cannot gift any units to each other. My ally had killed the unit with Orthus Axe (not Orthus, the unit that had taken the axe) and the intention was to give the axe to me sine I had the mounted hero from the Order with 5 movement (Mobility 2) and gitting the free Blitz promo would make our conquest that much quicker. There was no way to accomplish this since the axe now belongs to him and my units cannot take it, pick it up, nor can he gift me a warrior with the axe to make it mine. In previous versions there was a problem where gifting mages gave a free promotion every time it was gifted. Was disabling the gifting of units the fix for that bug? Was disabling the gifting of units the fix for that bug? Yes, it was disabled. If you're not in a permanent alliance, you could war him to claim it. The Calabim Governor's Mansion still gives +1 hammer per Angry Face instead of +1 hammer per Angry Citizen. Is this working as intended? If so, I could provide some save games as to why its a bad idea! I'm not at home atm so I can't check your save, but the problem could be that Stasis was cast. Look on the right hand side above all of the leader names. If Stasis has been cast, it'll say something like, "Production suspended for X turns" and "Research suspended for X turns." Running Vista home, patch q. CTD whenever changing to No State Religion from a religion. This has been going on for some time now (at least since the beginning of .40 for me. Running Vista home, patch q. CTD whenever changing to No State Religion from a religion. Just curious, why do you even do that? The Illians have a world spell, that when casts freezes all economic and productive efforts for the duration (20 turns on normal). The spell has been cast recently in your game, and will continue for 10 turns after the save game you have. Now would be a good time to change civics.